Rabindra Singha is staring at a bleak future. His 1.6 hectares (ha) in Rowta Bagan village are lying uncultivated. He lost his yield last year in riots that broke out in Udalguri district of lower Assam in October. "I was able to feed my family and make a saving of Rs 8,000 to 10,000 every year. This year I am in debt," said the 45-year-old who returned home in June after eight months in a relief camp. Singha is not alone. Over 150,000 people have started returning home from 50 relief camps in Udalguri and Darrang districts . Over 90 per cent of them are farmers and most do not want to go back to their fields. "The thought of the riots is scary. Our grain stock was destroyed and whatever we had cultivated till October was burnt," said Subal Biswas of the village. "Now I don't have the mental strength to cultivate." The riots had broken out between the Bodo tribe and Bangladeshi immigrants in Udalguri over a trivial matter of stealing poultry and spread to neighbouring Darrang. Several villages were burnt. Singha lost his house in arson. He spent the Rs 10,000 he got in relief on rebuilding the house. A sense of insecurity had been building among Bodo tribals because of immigrants settling in their area over the years. Udalguri district has the Sixth Schedule status, so no one except Bodo tribals can buy property there. Many Bodo and immigrant farmers are scared that working close to each other can reignite the hostilities. They say working as a labourer in towns could be a better option. "I won't risk my life farming," said Javed Ali, a migrant farmer who has returned to Laoduar village from a relief camp in Darrang. In some villages the movement of people in groups is still restricted. Guna Daimary, a Bodo in Darrang's Ikrabari village, said he has not been to his fields since October. "The last time I saw my fields, ripe paddy was standing in them. Then riots broke out," he said. Riots kept farmers away from their fields since October, affecting crop production, said Akhil Gogoi of the Krishak Mukti Sangram Samiti, a group of farmer-activists. "This is one of the major reasons behind the steep rise in prices of vegetables in Assam," he added. 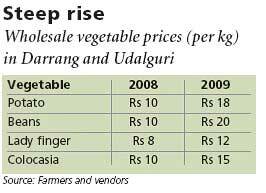 Prices of vegetables and food grains have gone up by almost 50 per cent in the state this year. 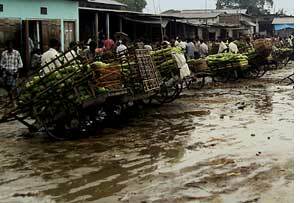 Besemari in Udalguri is the largest wholesale vegetable market in Assam. It supplies vegetables across Assam. Hanif Ali, a wholesale dealer in the market, earns Rs 1,000 per truck of vegetables supplied. But this year the supply of vegetables from farmers has dropped drastically. "Earlier, we used to send several truckloads of vegetables every day but this year we can manage a maximum of two truckloads," he said. Udalguri and Darrang districts account for a tenth of the total vegetable production in Assam, according to data of the state agriculture department. The two districts have over 300,000 ha of cultivable land and more than 280,000 farmers and farm labourers. Although no one has conducted any study, last year's riots have affected crop production, said R K Doley, district agriculture officer in Udalguri. Officials in Darrang share his view. Officials of the Assam Agriculture Department acknowledge the price rise but blame it on poor marketing facility. "We have had good vegetable produce in lower Assam. But in the absence of marketing facilities prices are not uniformly distributed," said Mawsam Hazarika, a senior agriculture development officer at the department. Hazarika cited the example of Kamrup district. "It is three hours' drive from Barpeta, but the price of vegetables in Kamrup is almost three times that in Barpeta," he explained.